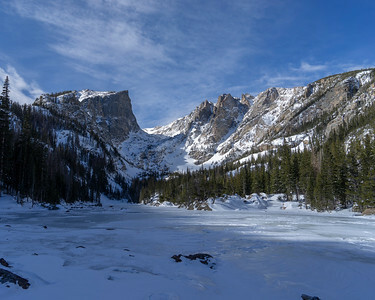 Image Description: A photograph of a frozen lake situated in a valley. 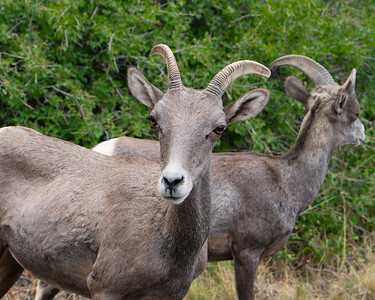 In the background, green evergreens are visible. 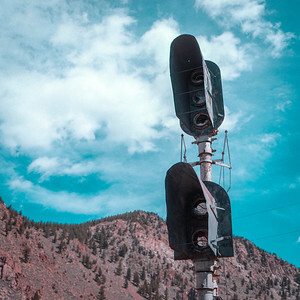 Behind those, stretching into a blue sky, are a snow-covered mountain range. The tops of the mountains are bare rock. One mountain on the left has a distinctly triangular shape. 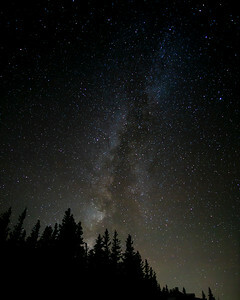 Image Description: A photograph of a night sky. 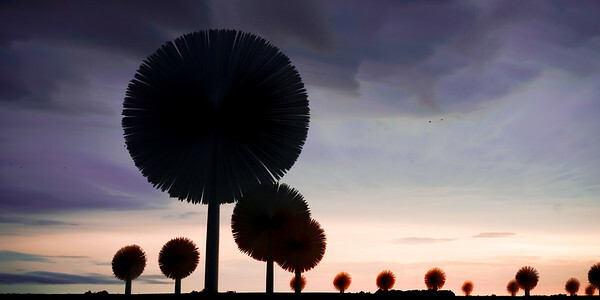 At the bottom, the silhuoettes of trees are visible. Behind them, part of the galaxy is visible. Hundreds of stars dot the sky. Behind the trees, though, the white haze of a city's light pollution clouds part of the picture. Image Description: A photo of a wide panoramic landscape. In the distance are tall mesas and structures made of red and orange rock . In the far distance on the right, the Rocky Mountains are visible. Shrubs and trees dot the mesas, along with the canyons below them. The sky is bright blue and full of fluffy clouds. One cloud on the left is visibly raining. 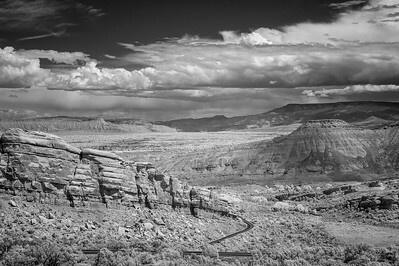 Image Description: A black and white photo of a wide panoramic landscape. In the distance are tall rocky mesas and structures. In the far distance on the right, the Rocky Mountains are visible. Shrubs and trees dot the mesas, along with the canyons below them. The sky is full of fluffy clouds. One cloud on the left is visibly raining. Full Poem: https://medium.com/@wdibble/positivity-culture-is-a-sham-6eeedc61bcd1 Image Description: A black and white photo of a desert-like landscape. The curve of a road can be seen from the far bottom left of the photo to near the bottom right, with another curve going up the middle and disappearing around a rocky ridge. 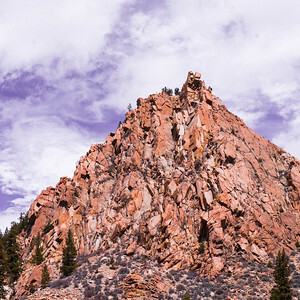 This rock ridge extends from the left side of the photograph to the middle, tapering off. Beyond that in the distance is another rock ridge, extending from the center off to the right of the frame. Beyond that is a flat landscape where a town is visible several miles away. 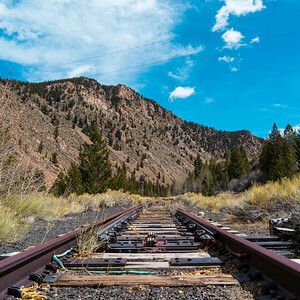 The horizon line is a landscape of mountains with sheer rock cliffs. The shadows of clouds cover these mountains. The sky is filled with dramatic, fluffy clouds that extend to the horizon, with clear sky visible at the very top of the photo. Original Poem: https://medium.com/@wdibble/i-remember-5a1c45680cd5 Image Description: An image of a snowy lake, taken from ground level. 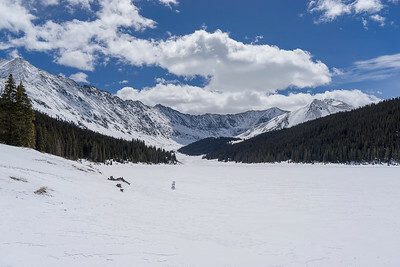 The frozen lake extends from the bottom of the photo to the halfway point between the bottom and top. Part of a creek is visible in the bottom left third of the photo. The water is black under the rocks and snow. Evergreen trees line the lake on both sides up through the background of the photo. In the background, rocky mountains rise into the clouds on both sides of the lake. People are hiking across the lake in the distance along the trees on the right side. Full Poem: https://medium.com/@wdibble/heal-thyself-d34ba93e154d Image Description: The image is of a frozen lake from above. The top half of the photo is taken up by evergreen trees. 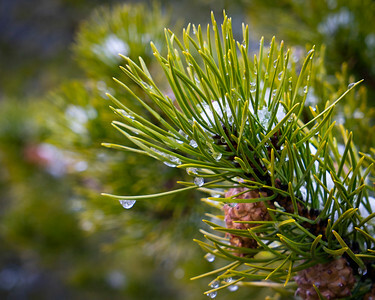 The tops of evergreen trees ring the bottom of the photo. 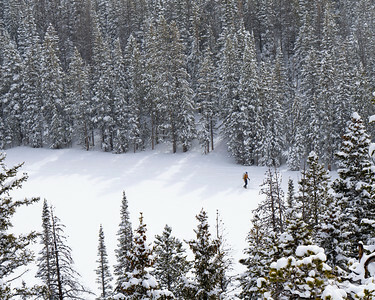 In the middle of the photo, which forms the bottom half of a circle, a hiker can be seen walking out of view toward the right. 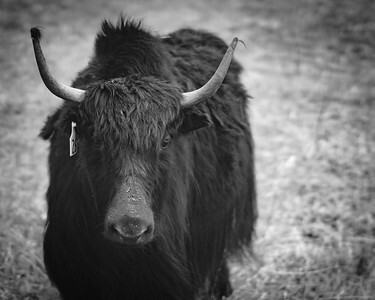 For full poem: https://medium.com/@wdibble/psalms-597bb46c073a Image description: Image Description: Black and white photo of a snowy field. On the left are a few evergreen trees. A mountain rises from the other end of the field to the right of the photo, out of sight. It is also covered in evergreens. 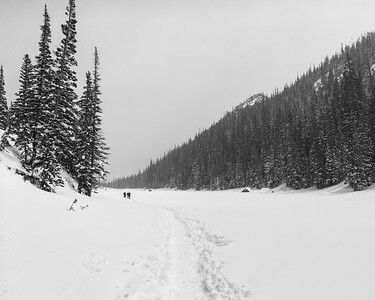 A trail can be seen through the snow towards three people walking away from the camera in the distance. The sky is grey and featureless. You are in pain, Let me help you I’ve known you a short time I feel like I’ve known you since mammoths walked I feel like your pain is my pain and the only way to relieve it Is to grieve and hurt with you You, my lover, my friend, stranger on the street who let me into your soul Let me help you shoulder that pain Nobody can cure the holes in our souls, fill them in with dirt, right away But together, we can start. And they might still look like fresh graves in a month or in a decade But we all deserve help stamping down that dirt, or putting flowers on it Whatever grieving and help look like, we all deserve love We all deserve that light Grieve. Let the feelings happen. It is okay. Find someone who loves you. Let them comfort you. If you feel like doing so is a burden, let me tell you, one heavy heart to another I know how hard it is to reach out I know that the shadow of depression leeches out your soul It’ll tell you that you are dragging them down It’ll help you put your hand down, it’ll breathe your voice for you, it’ll move your mouth And it’ll say, for you, “I am fine” You and I know otherwise. We aren’t okay. Fine is a liar. That old shadow hangs around every word, telling you lies Your friends don’t care You’re alone You don’t deserve help. It’s a liar. It’s a specter convincing you that you don’t deserve niceness. You do. You deserve someone sitting next to you Standing next to you Messaging you “You are not alone” You deserve someone who listens Who cares Who is willing to help you shoulder your pain That old specter will always be with us, taunting us Haunting us Let’s try to keep them at bay, to help each other weather their assaults Because you deserve that. You deserve someone who helps you take a break. You deserve help, and you deserve happiness. Image Description: A wide valley with snow-capped mountains from one edge of the frame to the other. The top half of the picture is a blue sky with fluffy clouds. The bottom third is a snow-covered frozen lake. 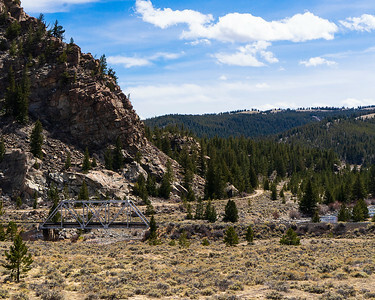 There are pine trees along the center of the photo, coming in from both edges and stretching toward the mountains. A lone snowman is near the center of the frame. 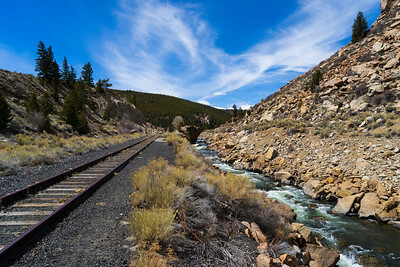 Image Description: A greenish river flows over rocks between two stone river banks. There are white water rapids in places. 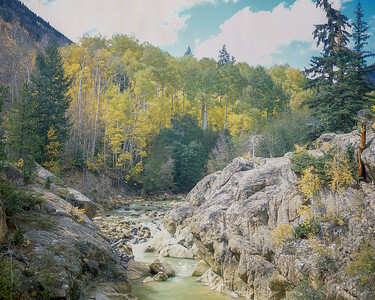 White-barked aspen with golden leaves grow on the bank behind the river, with a few evergreens. The sky is blue with white clouds. Will You Walk the Path With Me? 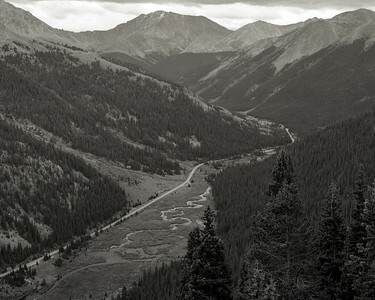 Image Description: A black and white photograph of a mountain valley. There is a road traveling from the bottom left to the top right, disappearing around a mountain bend. A winding river follows alongside the road. The mountains are covered in evergreen trees. Above the treeline, the mountains are barren. The sky is cloudy. 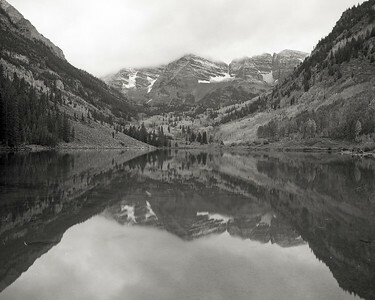 Image Description: A black and white photograph of the Maroon Bells at dawn. The tops of the peaks are covered in clouds. There is a reflection of the mountains in the water in the lower two-thirds of the photo. Trees of various colors cover the mountains to the left and right, and the upper slopes of the Maroon bells are rocky and snow-covered. 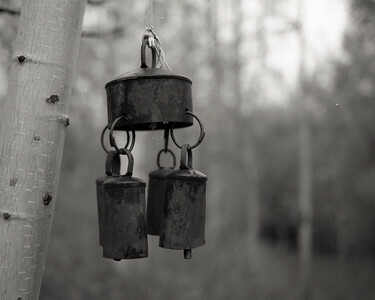 Image Description: A black and white photograph of wind chimes hanging from a tree. The chimes are rusty and centered in the frame. From the main circular piece, four smaller bell-like pieces hang down. On the left is the white bark of an Aspen tree. There are blurred out trees in the background.